Some of Glenwood’s oldest and most venerated names in hospitality, including the Hotel Colorado and Hotel Denver, continue to welcome the traveling public today! Others, while no longer in existence nevertheless played a vital role in Glenwood’s history and thriving tourism industry. In 1882, the enterprising Fred Barlow opened his first hotel, a tent fronted by a rough-hewn log structure with a sod roof. He served venison to his hungry boarders. With the profits, he built his second hotel, the St. James located at the junction of Blake and Seventh St. In 1888, Barlow upgraded the hotel to a three-story building; it was also known as the Barlow Hotel. A year later, Barlow sold his hotel to Sister Superior Mary Agnes who renamed it St. Joseph’s Sanitarium and Hotel. Her intention was to cater to rich and poor alike regardless of their ability to pay. Unfortunately, her proximity to the red light district along the riverfront led to an overabundance of less than admirable clientele and her venture went under within three years. Over the years this rooming house was also known as the Grand Hotel and the Hotel Yampa. It was torn down in 1934. Initially financed in part by town founder Isaac Cooper, the Hotel Glenwood opened in 1884. At the time investors were anticipating an influx of new business from the railroad that would eventually arrive in Glenwood Springs in 1887. The Hotel Glenwood started out as a two-story wooden structure and over the years became an ornate three-story centerpiece with 75-rooms that could accommodate up to 200 guests. It was located at 8th and Grand where Summit Canyon Mountaineering is today. The upscale hotel attracted guests like H.A.W. Tabor and his wife Baby Doe, the Osgoods, Jerome Wheeler and John “Doc” Holliday who died there in 1887. On December 14, 1945, the Hotel Glenwood was completely destroyed by fire. Proprietor Thomas Kendrick established his rooming house in 1884 several months before the Hotel Glenwood opened. While the Hotel Glenwood catered to the well-heeled visitor, Kendrick House located on Seventh St. behind the current county courthouse, attracted the average visitor with much more reasonable rates: 50 cents per day or $2.50 for the week. The well-connected silver baron Walter Devereux was Glenwood’s leading developer and visionary. It was Devereux, along with Isaac Cooper, who first dreamed of building a world caliber spa and resort. After completing the construction of the hot springs pool, the sandstone bathhouse and improvements to the vapor caves, Devereux set about building a hotel to rival Europe’s finest accommodations. The Hotel Colorado opened its doors in June of 1893. It was so spectacular that newspapers of the time called it a “marvel of the age,” and the “finest resort hotel between the Great Lakes and the Pacific.” The exterior featured Victorian gardens, a bird sanctuary, tennis courts, a Florentine fountain and a railroad spur for the private rail cars of the rich and famous. The interior was equally opulent. The most dramatic feature was an indoor waterfall. In 1905, the Hotel Colorado became the temporary White House for President Teddy Roosevelt during his three-week hunting expedition. Also during that year Walter Devereux suffered a stroke and his longtime friend and associate, F.H.A. “Hervy” Lyle took over running the hotel. It was under Lyle’s direction that the Hotel Colorado and the Glenwood Hot Springs Company merged in 1912. That same year, Lyle died unexpectedly from appendicitis; the hotel bookkeeper Elmer Lucas assumed the helm until his death in 1927. His wife Katherine ran the hotel through the worst of the Great Depression, finally selling to a syndicate headed by Frank Kistler, a Colorado oil man in 1938. During the war years, from 1943 to 1945, Kistler leased the hotel and hot springs pool to the U.S. Navy. In order to meet the sanitary requirements of a hospital, the ornate hotel was essentially stripped bare. Kistler sold his interest in the hotel in 1946 which marked the beginning of a revolving door of owners. In 1974, under the direction of Kirk Whiteley the Hotel Colorado was designated a National Historic Landmark and restoration of the Grande Dame began. After refurbishing the hotel, the Whiteleys put it up for sale. In 1988, the hotel fell on hard times again when the bank foreclosed the property. Fidelity Bank, owned by the Bastian family, purchased the hotel at auction and transferred the hotel to a separate entity, Glenwood Properties, Inc. which contracted with Denver-based Signature Hospitality Resources. Under the new direction, the hotel became profitable once again and was gradually restored to its former grandeur. The Hotel Colorado celebrated its 100 birthday in June of 1993. Where the Hotel Denver building now stands were once four saloons, a restaurant, a grocery store and two rooming houses. Throughout the years, this hodgepodge was expanded and combined by the successful rooming house owners Art Kendrick (Thomas Kendrick’s son) and Italian immigrant Henry Bosco. Kendrick and his wife Mary leased several rooms above the grocery store portion which they called The Denver Rooms. On the east side of the street Henry Bosco built the Star Hotel in 1915. Prohibition began in 1916 which caused many bars along the street to close and enabled the Kendricks to purchase additional space and begin a major remodel. In 1938, Mike Bosco (Henry Bosco’s nephew) purchased the property from the Kendricks. Bosco chose to keep the Hotel Denver name. In 1973 the Bosco family sold the Hotel Denver. From 1973 to 1991, the Hotel went through several owners and turbulent financial times. The current owners purchased the Hotel Denver in 1991 and it once again returned to its roots as a family-owned venture. In 1996, the Hotel Denver opened the award-winning microbrewery, Glenwood Canyon Brewing Company. In 2001, the final step in joining all the buildings along Block 45 of the original township was completed with the purchase of the Rex Hotel. The Hotel Denver celebrated its 100th anniversary in 2015. Located at 716 Cooper Avenue, just round the corner from the Hotel Denver, the Western Hotel was once owned by Mike Bosco who also owned the Hotel Denver. Bosco ran the small hotel as the Bosco Rooms until the 1920s before it became known as the Western Hotel. Considered a working-class establishment, the hotel provided modest room and board for local workers. Like many hotels at the time, it was built in phases beginning in 1888 when it featured a saloon and restaurant. Additional renovations were made between 1904 and 1907. In 1912, a brick second story was added to the original structure. At this time, prior to prohibition in 1916, the hotel is said to have been an active location for ladies of the evening working in Glenwood’s thriving red light district. In 1939, Bosco sold the Western to John and Ida Toniolli for $5,000. In 1945 another section was added to the rear of the hotel and in 1951 the first-floor main façade was renovated. John Toniolli died in 1980 and Ida took over the operations. Ida Toniolli retired and closed the hotel in 2012 when she turned 101. The Western Hotel is being considered for listing on the National Register of Historic Places. The influx of Polish immigrants to Glenwood Springs began in the 1970s. The Poles who reside in Glenwood Springs today are the extended relations of an earlier generation of immigrants who came to the U.S. after WWI seeking a better life. Even though the borders were officially closed during the Soviet occupation of Poland from 1945 to 1989, those people with relatives in the U.S. were permitted to correspond via mail, visit and eventually relocate to America. Most settled in the Chicago area. After one family bought a motel in Glenwood Springs; word spread within the tight-knit Polish community in Chicago about the business opportunities available in Western Colorado. Over the next several years, other families followed to purchase and run their own lodging establishments. In addition to the allure of being self-employed, the Poles were attracted to Glenwood’s mountain and river terrain which reminded them of the rugged topography of their home in southern Poland. As avid outdoor enthusiasts, they also fell for the Valley’s action-packed lifestyle that included skiing, hiking and rafting. Like other immigrant groups, Glenwood’s Polish community helps to make Glenwood Springs a diverse and interesting place to live and visit. Polish-owned motels in Glenwood Springs include the Frontier Lodge, the Cedar Lodge, the Caravan Inn, the Starlight Lodge, the Silver Spruce Motel, the Glenwood Springs Inn, Hanging Lake Inn and the Rodeway Inn. 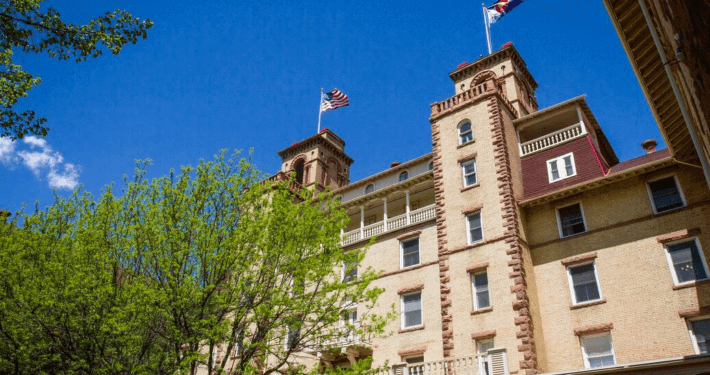 Explore all of the historical things to do, learn and see in Glenwood Springs with a modern twist; there is something for everyone and a new adventure to be had every day! For more Glenwood Springs history, visit the Glenwood Springs Historical Society and Frontier Museum.